For most homebrew users, the first hurdle to get over is the difficult setup and usage of WebOS Quick Install. Even myself, its developer, have to admit it had huge issues that would make is challenging to use effectively. A quick glance around the forums shows many other users having issues doing some of the most basic things, like installing Preware. And as webOS 2.0 users can attest, WebOS Quick Install is nearly incompatible with their devices. Forget all of that. Seriously, forget it all. WebOS Quick Install 4.0 has landed and it's a completely new beast. While some outside appearances may resemble 3.x, rest assured, under the skin, 100% of the code has been redone from the ground up. Such a massive redesign offered many new possibilities to make WebOS Quick Install something much greater than it was before. Indeed, version 4.0 includes many new features that will come as a welcomed surprise. For one, it's now properly webOS 2.0-compatible. Just in time for Feburary 9th too. Perhaps more notable, having webOS Doctor on your machine is no longer a requirement! Yep, that's right. Well, technically if you're on Window or Mac, you'll need a webOS Doctor temporarily to install Novacom (if it's not already installed), but beyond that you won't need it. First time setup has never been easier. Another huge change is the feed viewer. Gone are the days of a simple list; with v4.0, WebOS Quick Install's feed viewer is a fully-immersive portal to the homebrew community. 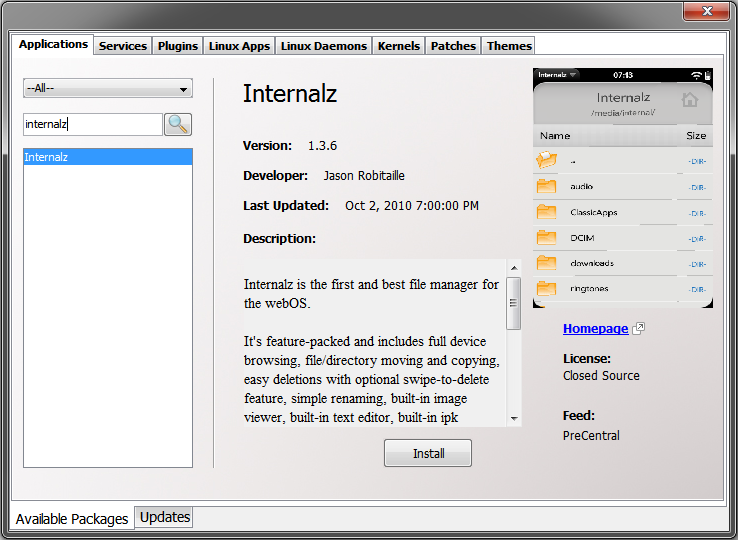 A tabbed interface let you see applications, patches, themes, kernels, and everything else, along with all available updates. All the bells as whistles are there: package details, screenshots, category filtering, search boxes, and even custom feeds. Not only that, it now adheres to the homebrew package standards, including dependencies. In addition, it's worth noting that WebOS Quick Install 4.0 now features a dynamic dropdown list that lets you quickly switch between any connected webOS devices. And international users, don't fret. Thanks to the help of several translators, WebOS Quick Install now fully supports French, German, and Simplified Chinese. 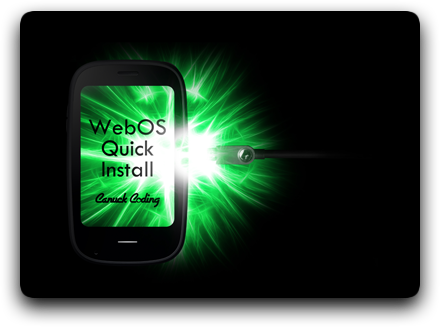 WebOS Quick Install 4.0 is now available for download. Check out the full change log for more details, and give it a spin. It's definitely much easier to use than it used to be, while managing to be more powerful too. And hey, if you like it, consider a donation to show your appreciation.